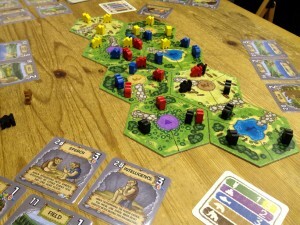 In Power Grid: The First Sparks, players have stone age clans trying to expand into new areas. The First Sparks is a simplified (and differently themed) version of the very popular game Power Grid – I’ll talk about how the two compare at the end but will write this review from the point of view that you haven’t played, or know, Power Grid. 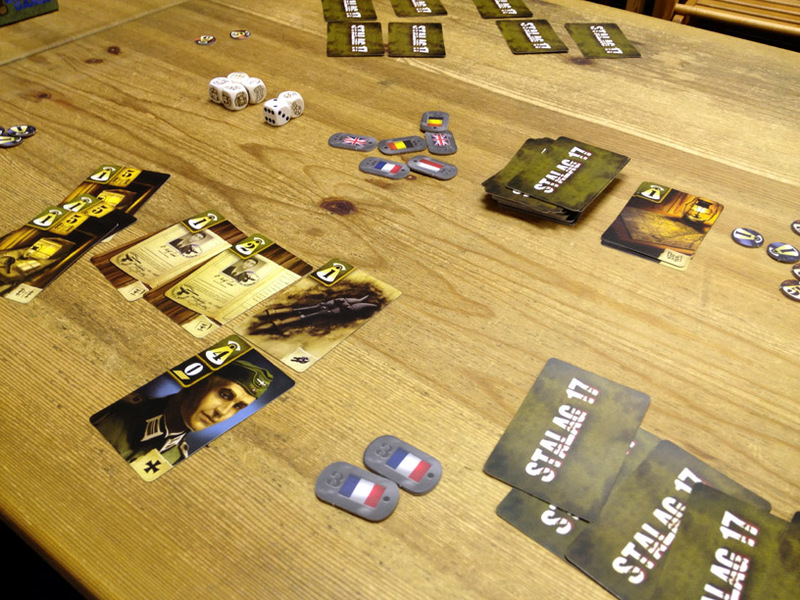 In Stalag 17, players are prisoners of war assembling their escape plans – the first to have all 3 of their POWs escape wins. At the start of each escape attempt, some dice are rolled which determines what equipment (food, uniforms, maps,etc.) will be required for this escape attempt as well as a normal dice (1-6) which is the runaway score that a player needs to equal or beat too. In Drum Roll, players are putting on circus shows with the winner scoring the most prestige points (PPs) after three performances. Not be confused with Krok Nik Douil’s game also called Mammut, this Mammut is a game by Queen Games. 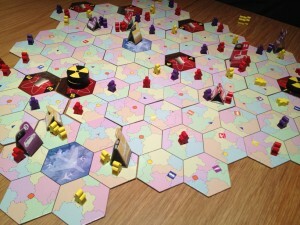 Players try to gather tiles which all score in different ways. This sounds very normal but the way the tiles are gathered is a very interesting mechanic delivering a funny and humorously evil game. The game is played over several rounds – scoring occurs after each round and the player with the most victory points (VPs) wins. Each round 31 double-sided tiles are mixed up in a bag and then dumped onto the table and spread out. The tiles show fur, claws, axes, meat, fire and animals. Some tiles have question marks on them and these will only get turned over to reveal their actual value when scoring starts. 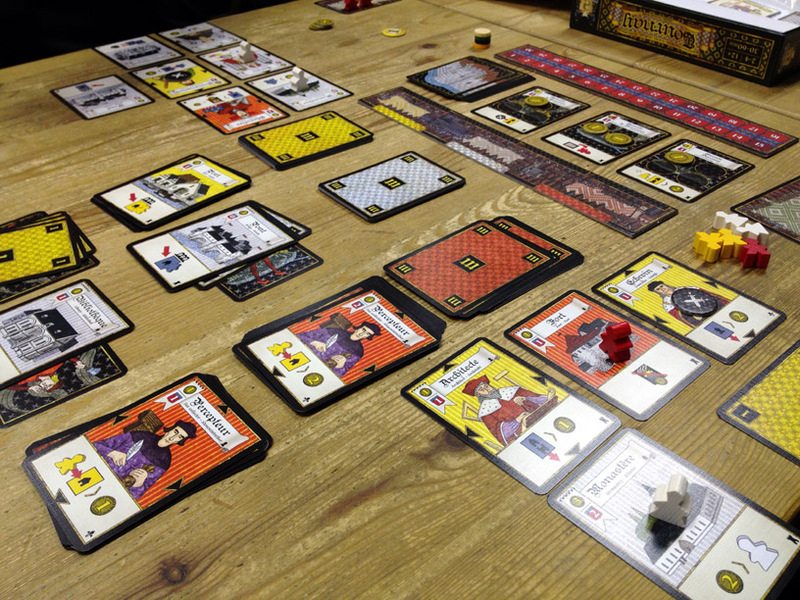 Tournay is a card-based game where players aim to score the most prestige points (PPs) by building their own town. It’s by the same designers as Troyes (which was why I pre-ordered a copy) but, whilst it uses the same art style as Troyes and a couple of similar-ish elements, Tournay is very different to Troyes and not the card game version of it at all. 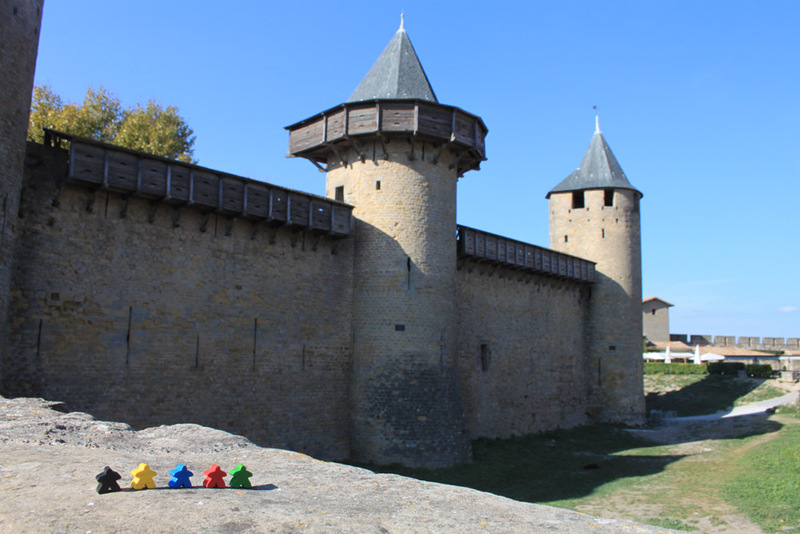 Following on from my Alhambra at the Alhambra post, just this week my friend Andy visited Carcassonne and he took Carcassonne the game with him. He didn’t know of my Alhambra visit but, instead, was inspired by my photo of meeple at the world’s highest pass (5,416 m / 17,769 feet). Some years ago a friend of mine who is a teacher told me about a co-operative exercise he’d created for his students where they organised search-and-rescue operations. 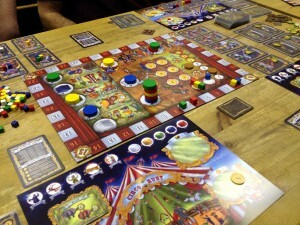 It sounded great and we discussed how it had potential for a board game as he plays some Eurogames. So, I was very interested when Meltdown 2020 was announced. 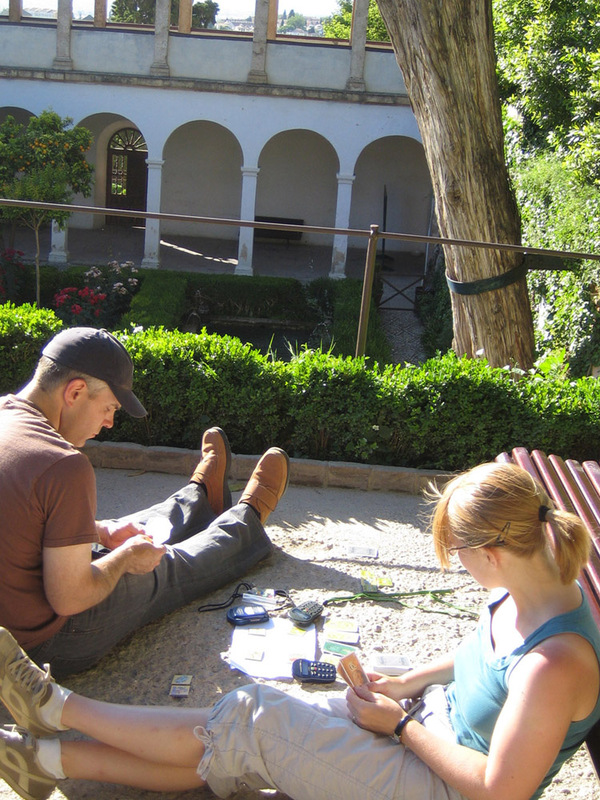 Some years ago, I visited the Alhambra in Granada, Spain. 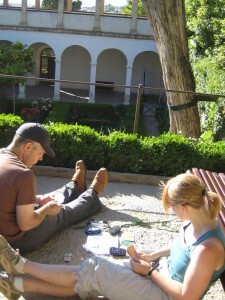 It seemed only right that I took the game Alhambra with me and managed to play a game of Alhambra at the Alhambra itself. The photo proving this is below – it’s not a beautiful photo to be honest but it’s the only proof photo we took. Since then I have been wanting to play more games named after a location whilst at the location (especially Escape From Colditz – yeah, not a great game these days but still…) I missed the opportunity to play Rome in Rome when there a few years ago (rookie error not to have taken that with me) and I didn’t own Pompeii when I went there either. So, many opportunities (Manhattan, San Francisco, the list is very long…) but I didn’t have the idea when I visited those. Anyway, it’s a goal I now have. Thinking of which, I need to borrow a copy of London and get that one done as I’m there all the time. I haven’t decided where I stand on games with names that include a location – I’m not sure if they count – for example, Letters From Whitechapel if played in Whitechapel, or Looting London played in London. Have you played a game at its real location? Tschak! is a small card game where players are trying to gain treasure and avoid monsters but the gameplay offers something rather clever. 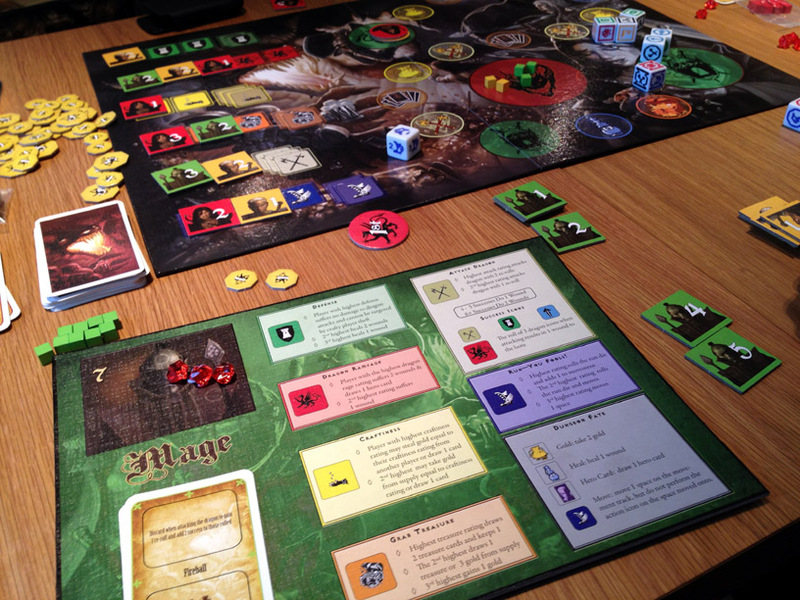 The 40 cards consist of wizards, warriors and dwarves with different values on them. 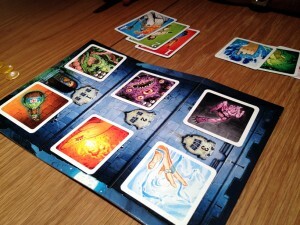 Each player is dealt 3 of each, plus one artefact card making a hand of 10 cards. Players will assault 4 towers (one per round) and the player with most victory points (VPs) at the end wins. 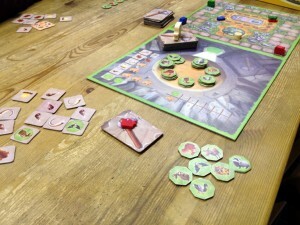 Each tower has 3 levels played in order and each level has a random treasure and monster placed on it. For each level, players play a total of 3 cards and the player with the highest combined value of cards gets the treasure (VPs) and the player with the lowest gets the monster (negative VPs). A couple of the cards have special abilities: one wizard’s value is only the same as the most powerful wizard played by another player, and the artefact card doubles your weakest card.